As civilization progresses, in many business field, the world has become more and more specialized and focused. Southwest focuses on one type of aircraft, 737; Foundries specialize in chip manufacturing for specialized chip designers; Tesla thrives to deliver one car at a time. This is also true in the biotech world. Old big pharms are falling (or failing?) behind biotechs in innovation. The success of Gilead highlights their absolute focus on nucleotide analog for viral diseases. Saving any more philosophical discussion, Cubist is a niche company who knows crystal clear what it want to do. Besides that, it also has good track record at execution, with its faithful product deliveries and strategic acquisitions. As antibiotic abuse makes multidrug resistant bacteria more and more common in USA and around the world, Cubist has the potential to save the world, and make some money along the way. Currently, majority of revenue comes from Cubicin. Dificid and Entereg recently joined its portfolio after acquisition deals. The company is trying to re-market them. There are also promising candidates in the pipeline: Tedizolid is likely to be approved; Ceftolozane/tazobactam NDA is just submitted; four more new indications (including two more new drugs) are in phase 3 trial. 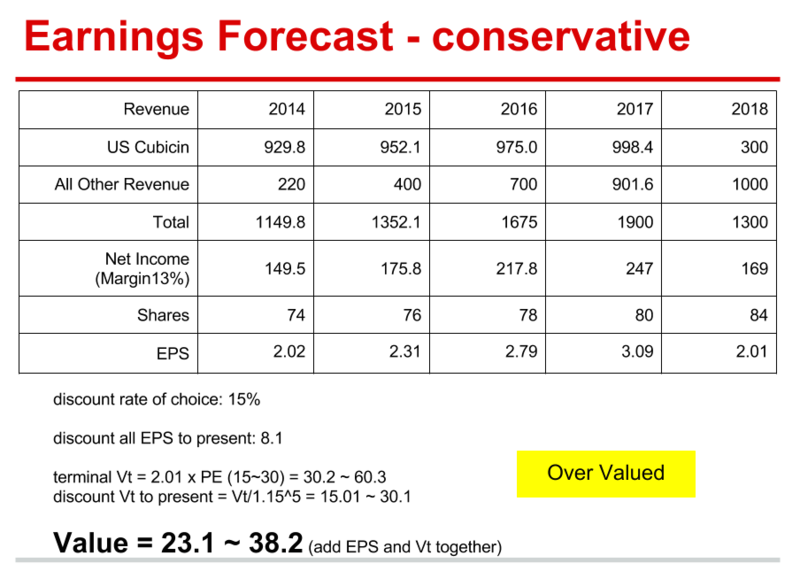 However, as technically promising as Cubist is, Cubist may not be a great company for investment. Antibiotic field is getting crowded again. With the incentives from GAIN act, big companies are coming back, and small companies are already competing in this once-ignored field. Some main competitor drug (such as linezolid) is becoming generic, and in the meantime, Cubist’s own products may also suffer from the doom of resistance. In addition, its heavy commitment in R&D won’t see a relief in the near future. 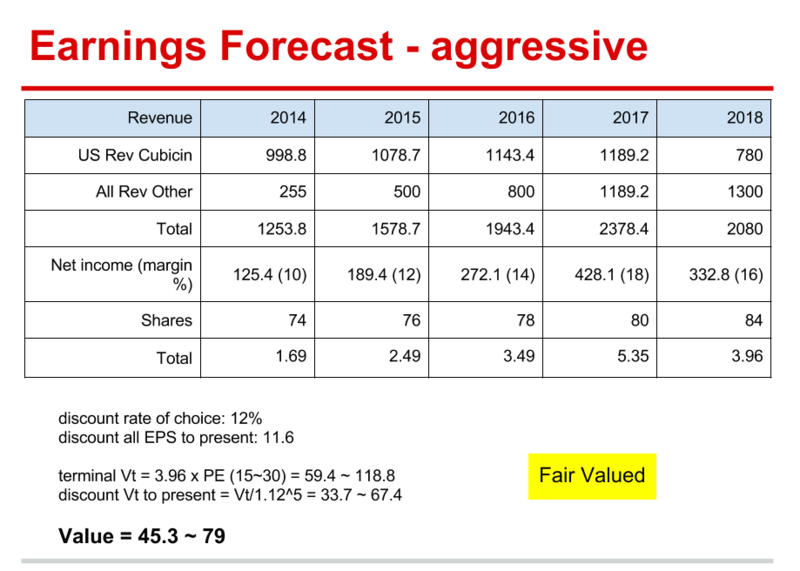 All the factors above give Cubist a below industry-average net profit margin. Its best record was ~16% in 2012 and it even lost money in 2013 due to aggressive acquisitions. CBST’s fair value is about $23.1 – $38.2 (conservative case) or $45.3 – $79 (aggressive case). Good sales either by marketing or from rise of MRSA.